Dramm is now offering an optional nozzle extension for its line of TracFog PTO-driven fog systems. These nozzle extensions extend the nozzle outlet so that the fogger can easily treat individual Quonset greenhouses from the doorway just by driving alongside. The nozzle extensions thread onto the standard outlets on the TracFog and can be easily swapped in a matter of minutes. Many greenhouse businesses have a combination of gutter connected and individual houses. 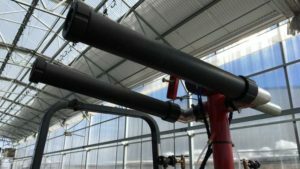 The nozzle extensions allow the unit to be used to treat both types of greenhouse easily and quickly. The TracFog is available in two different sizes for different sized greenhouses. The 25-gallon unit can treat 500,000 square feet with one tank, and the 100-gallon unit can treat 2,000,000 square feet. The TracFOG allows growers to rapidly treat large areas, reducing the amount of labor and improving efficiency and efficacy of sprays. For the last several years, Dramm has offered an online forum to allow growers to post questions and review prior questions and answers for any of its products. This feature is designed to help growers find solutions quickly, even during off-hours. To facilitate this process, Dramm has now expanded the forum to include the most recent posts on the sidebar of each product page. Now, growers can view forum questions and answers for specific products right on that product page. “We recognized that customers will visit the product page when they have questions,” says Kurt Becker of Dramm. “Including the posts focused on that product helps centralize information for quicker access. Customers could already find product manuals and operational, how-to and troubleshooting videos on the product pages. Dramm continues to look for ways to help our customers succeed. Continuing to update our information offering is part of that commitment. For more information, go to Dramm.com.